The beer garden is indisputably one of the most memorable places for beer lovers, beer sympathizers, beer neutrals and even beer haters all over the world. Today I also wanted to introduce you to a different kind of beer garden. The DIY pun kind. Few are those who won’t at least smile when they see this arrangement, many will laugh, some might even find it hilarious. If there was ever a beer lovers’ gift that will never be forgotten this is it. I promise you. This little thing delivers! It easily beats the beer can cake. About nine years ago I was telling Chris how it would be just dreamy if we were independently rich and just for fun owned a restaurant with a beer garden. We would serve a tasteful menu of continental and indigenous American craft beers and simple food that pairs great with it. We’d only be open May through October. The rest of the year we’d spend somewhere warm, enjoying our independent wealth and planning for the next beering year. Alas, we do not have that kind of money, so he made me a beer garden just like the one you see in the pics – a little smaller perhaps, but incredibly impressive. There was a rosemary plant I remember and a couple of white potted flowers. 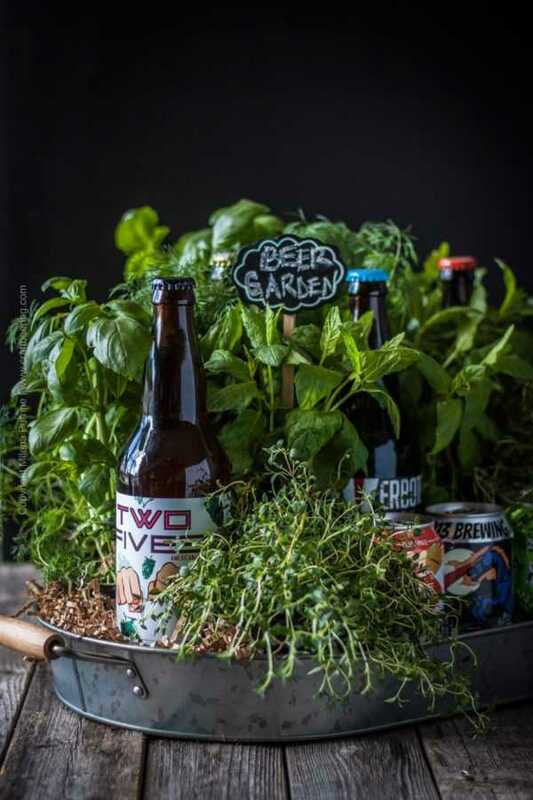 For this post I chose potted culinary herbs, to reflect our love for cooking with beer but if you wanted to make one to give as a gift you can absolutely opt for potted flowers or even a tastefully made hops wreath. On a more serious note let me use this post to honor the true concept of a beer garden in a couple of paragraphs. To Chris and I it is synonymous with letting go and getting immersed in the craft beering lifestyle, but it is so much more to so many people. What Is A Beer Garden? By definition it is an outdoor garden like space where beer is served, as opposed to a beer hall (an indoor space) and a beer cellar (an underground space). Beer gardens are usually attached to a brewery, pub or tavern. There is always great food and a band. Chestnut tree crowns provide shade for the patrons seated on benches flanking long, solid wood tables. Why chestnuts you may wonder? Well, the story goes that before refrigeration was available the need to keep beer cold and spoilage free during the summer months in Bavaria lead to the following ingenious set up. Huge casks full of refreshing lagers and wheat beers brewed during the cold months were stored in large beer kellers (cellars). Large blocks of ice carved from nearby lakes were brought in to keep the beer cold. Chestnut trees were planted on top of the ground under which the cellars were located, to provide shade and assist with moderating the ground temperature (ie prevent the surface ground layer from overheating during summer). The beer stored in the cellars remained cold and the shade of the trees invited the placement of tables and benches underneath the chestnuts. The largest outdoor beer garden in Munich – Hirshgarten, is also the largest in the world. It has an 8,000 seats capacity and is part of a large restaurant operation. About 1,200 of the seats are in an area serviced by the restaurant. The patrons enjoying the rest of the seats, nestled under the mature chestnut trees are served the same tasty, cold brews and are encouraged to obey the long time tradition of bringing their own picnic baskets full of food. In the US the original beer gardens emerged as an extension of the flair and traditions left behind by German immigrants. They started appearing as soon as those early immigrants started brewing. Some of them, like Schlitz Park in Milwaukee were large, elaborately designed spaces where families spent their weekends enjoying all sorts of outdoor activities besides the beer. Then the music stopped when Prohibition came about. Today, the concept is gaining traction with confidence and beer gardens are once again a popular summer draw for beer lovers alike. Some very true to the Bavarian traditional model, others resembling modern patio style retreats. Many craft breweries add beer gardens to their taprooms, especially the more established ones with greater resources. The German word is Biergarten (bier=beer and garten=garden) and the most frequently related term to it is that of Gemütlichkeit – the cozy German term for geniality and friendliness leading to a genuinely welcoming atmosphere. The two go hand in hand. It would be fair to state that a biergarten presupposes Gemütlichkeit and that it is a major social institution in and of itself. Beer has always brought people together and the Bavarian biergarten concept has elevated the act. The traditional German beer garden is designed to welcome many patrons and people sit together – friends or not (yet). The table sharing prompts exchanging stories with strangers, making new friends, feeling at ease. It is a place of welcome where people go to enjoy their favorite brew, good food, fair weather and to socialize. Beyond the traditional German items beer garden fare varies from area to area and with the world wide fascination with beer gardens, the selections comprise a veritable beer lovers’ feast. Chris and I hang out in beer gardens a lot during summer and for those of them that are part of a brewery without its own food operation it is typical to see at least one food truck. Among our favorite nosh are loaded nachos and traditional Mexican tacos, but we don’t pass on savory crepes or BBQ burgers. Before we had a son we spent the greater part of a few summers in the South of Germany, the French region of Alsace, Austria, Croatia and Greece. One of our favorite things to do was seek out local beer gardens and try the beer and the local food. Tarte flambée or grilled octopus anyone? We haven’t yet been to Japan (besides connecting flights in Tokyo) where rooftop beer gardens are all the rage but hope to do a brewery tour there soon and visit local beer gardens. 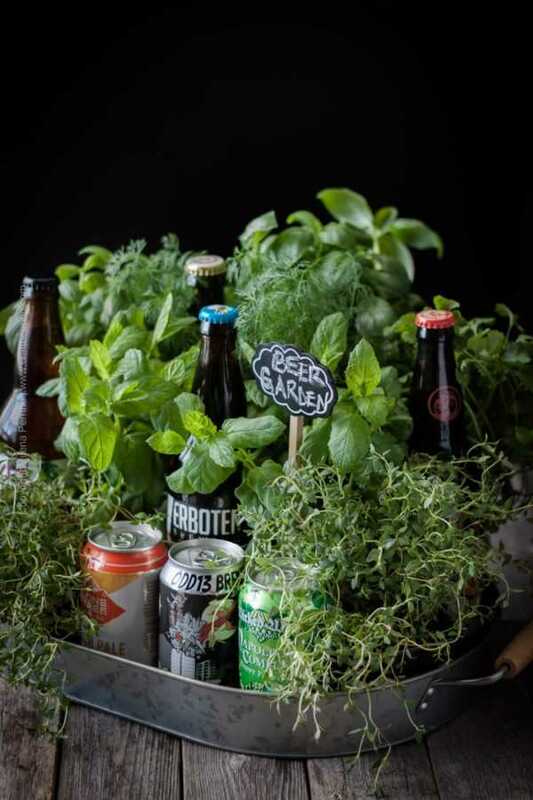 In the past few years we’ visited China and Vietnam and even though the craft beer culture there is still nascent, we had the pleasure of identifying outdoor establishments resembling beer gardens in every possible way. There is some fabulous beer food in each country. Last, but not least, my favorite beer garden menu items from spending my late teens and early twenties in Bulgaria are Princessa sandwiches and Fries with Feta. This summer we will do a series of posts on the different beer garden menu foods we’ve enjoyed most during our travels (see link under Craft Beer & Food). Consider this post as the opening one for the series. We will try to dish out one item weekly, all the way until the Craft Beering annual Oktoberfest Bash. And we will include all beer garden menu items we have posted recipes for until this moment. Back to our cute symbolic beer garden arrangement. Do give someone who likes beer one – at a minimum you will make their day. And they will think you are so witty! Not that you need a tutorial, but here are a couple of basic options to assemble a beer garden pun gift. Of course, feel free to elaborate. 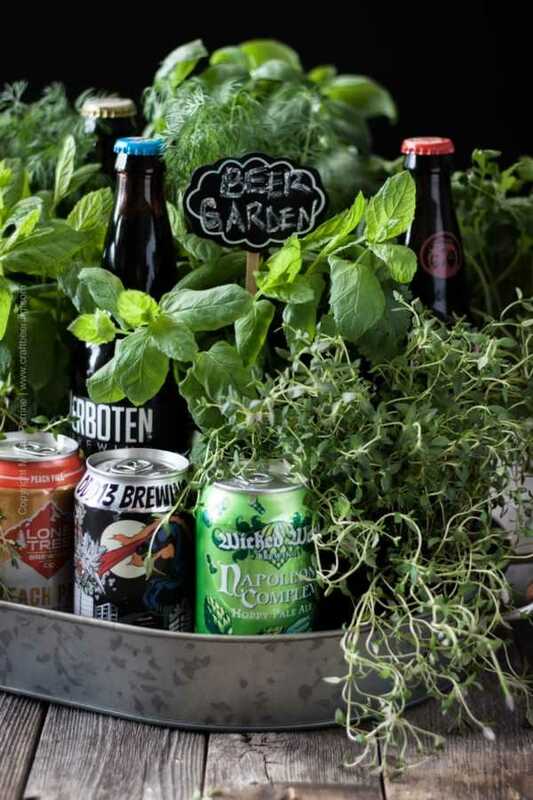 Buy a bunch of grown potted herbs (or flowers), several beers (select styles the recipient enjoys), a cute tray style container or a wooden crate/box and most importantly get a label onto which to write the magic words. A longer lasting alternative would be to get an herb garden kit and a suitable herb planter. 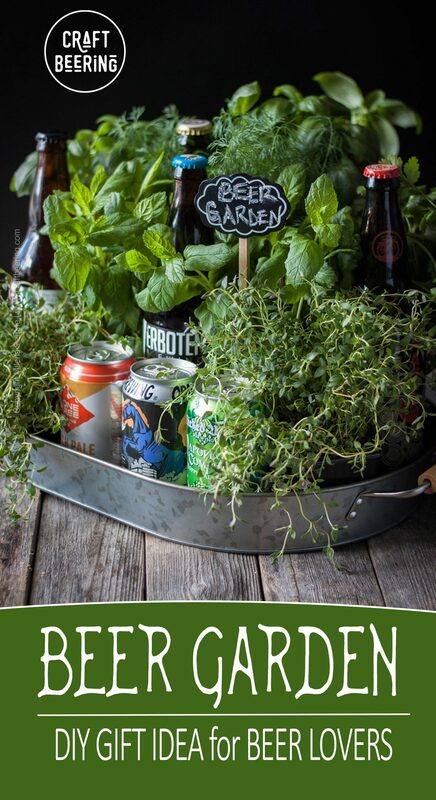 You can nestle the beers in some of the compartments of the planter and plant herbs in others. 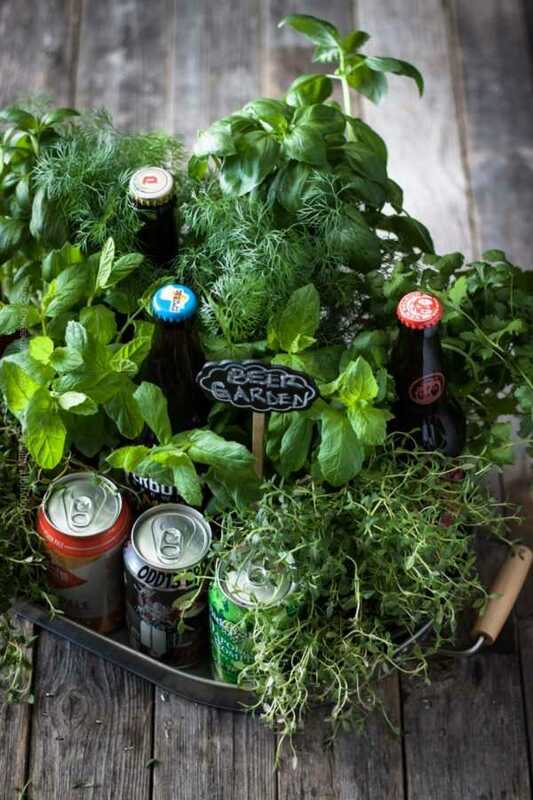 Once the recipient is done with the beers, they can plant more herbs and will have a pretty herb garden to enjoy. 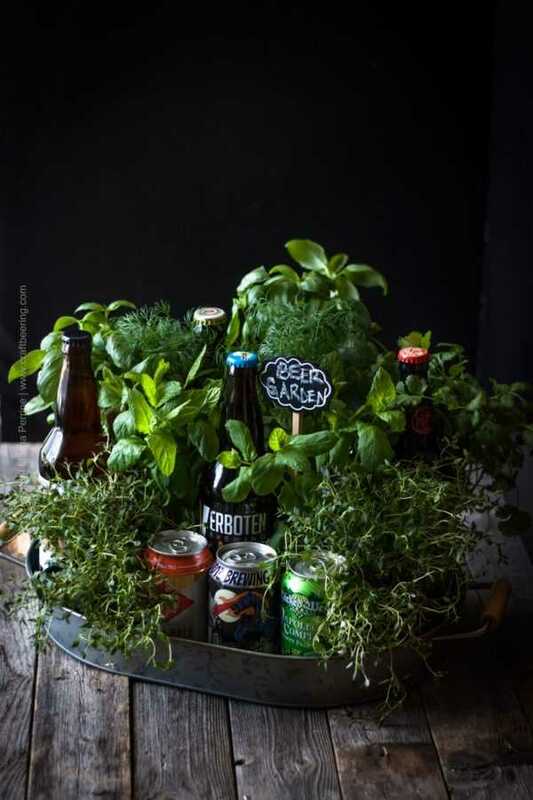 Along the lines of our idea, but not exactly the same is this Self Watering Beer Lover Herb Garden. Yes, a great week is in progress:) Thank you! We hope to kick of beer garden season this weekend, weather permitting. Thank you, Kelsie! We also don’t have the best of luck growing herbs, but sure appreciate having fresh ones around. It is a constant struggle:) Yey! Summer and its beer garden snacks will be so much fun! Thank you, Mary! We love the laid back atmosphere of beer gardens and being outside too.